When Lolo told me we were going for the British Motorcycle Rally, I was all charged up. I thought he was going to do a Schumacher on his Triumph and I had mustered my guts to play the best handyman. My layman opinion of a rally is you have a starting point and everyone races to the finish; the one who comes first wins the race. But the British Motorcycle Rally held at Castlemaine near Melbourne put to rest all my speculations about a rally. I was disappointed and relieved at the same time. As I found out, this is a rally where all motorbike owners of British brand motorcyles assemble at one main point and have a fun time unwinding from life routine. So, we began our journey on Saturday by meeting with Lolo's friends at Whittlesea, 30 mins from where we live. 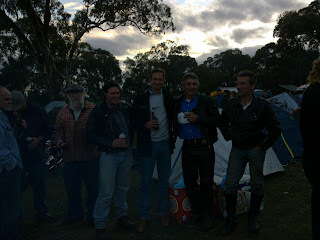 About 10 of his bosom friends met up - they have been doing this since age 18 - and we drove all the way to Castlemaine, the main assembly point. It took us four hours to reach our destination. We stopped at four points for filling up gas, toilet breaks and lunch. I thought it was the most scenic of rides - with Autumn just setting in, the countryside and small towns we passed were simply breathtaking in the way the leaves had turned their shades of green and nature changed its colour. Finally, when we reached Castlemaine, I was in in for surprise. More than 1200 bikers had assembled. Camps were set up and bonfires lit. It was so organised. There were mobile toilets, bars, food stalls to cater to all the bikers who had come from all over Victori and other states. A local band swooned the crowd with their numbers and I found myself dancing non-stop. Everyone carried tubs of beer and drinks. The bikers, as I saw it, were assembling to have a fun time drinking and talking about bikes. Except Paul, proud owner of an 85-year old Norton, "I love bikes but I can't talk about it for days," he told me. He was enjoying the bonfire and his choice of wine. Over rounds and rounds of beer that night, we took part in the bonfire and checking out of bikes. There were bikes of all shapes and sizes. The judges had a field day. Prizes were accorded based on their maintenance, durabality, restoration, age and so on the next day. I was talking to bikers and I realised how each of them treasured their bikes as prized possession. It's not like India or other developing nations where bikes are more a necessity. Here it's a luxury item. I grew up thinking men treated their bikes like women. That perception has not changed as I found men still talking about how they were seduced by that one bike and how they acquired 'her' when still single. I guess passion for bikes equals love for a woman, with most men! 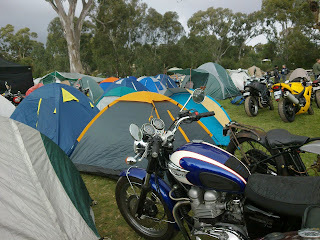 I came back experiencing a few firsts: seeing men so passionate about their bikes and sleeping on a camp! I met tons of Lolo's childhood friends, binded by a common passion for bikes. One told me how the mind is like a parachute and works best when open. Poignant thought for a night I thought. When one is happy drunk, the thoughts pour. Some thoughts overstay their welcome!